When you connect your team's shared inbox to conversations, all incoming emails will be sent to this inbox. To keep your inbox organized, configure filtering rules in your inbox settings to keep your inbox free from emails that don't require your team's attention. In the left sidebar menu, navigate to Conversations > Filtering rules. Subscription Link Emails: emails containing unsubscribe links. Marketing Emails: emails sent as part of a marketing campaign. Automated Response Email: an auto-generated email such as an automatic reply or out-of-office reply. If there are emails from a particular email address or email domain that should never be filtered in your inbox, enter the email address or email domain into the Whitelist text field. You can add multiple emails and domains, adding a space or comma after each entry. 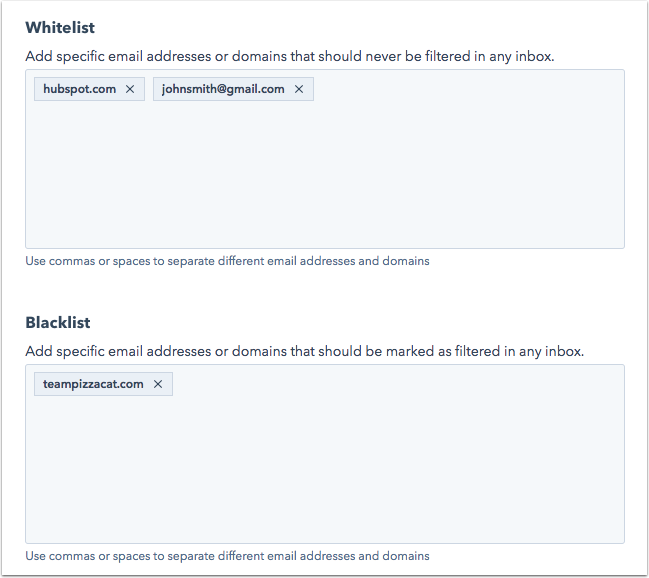 If there are emails from a particular email address or email domain that should always be filtered in your inbox, enter the email address or email domain into the Blacklist text field. You can add multiple emails and domains, adding a space or comma after each entry. Emails sent from an existing contact in your database will not be filtered, unless the email is an automated response. Emails sent from your connected team email address to that same email address will be filtered. Emails sent from a blocked visitor will be filtered. Emails sent from noreply@hubspot.com will be filtered. Emails sent from your HubSpot portal (e.g. emails sent from your workflows) will be filtered. Please note: these automatic rules cannot be overridden with the Whitelist field. Click the email in the filtered view. 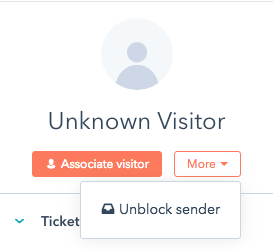 In the visitor details in the right sidebar, click the More dropdown menu and select Unblock sender. In the dialog box, click Yes, unblock email address. To keep your inbox and account clean, any emails that are filtered will not trigger any automated actions in your workflows. This includes creating contact records, tickets, and notifications.